下载程序安装，重启资源管理器或重启电脑之后，打开资源管理器 窗口在工具栏上右键添加 QT TabBar和 QT Tab Standard Button两个工具栏，自己按习惯调整位置，便可以体验用标签来管理资源管理器的乐趣了，在工具栏上点右键后，可以进入选项设置一些自己喜欢的习惯，此 后无论何时，你的任务栏里有且仅有一个窗口了. RequirementsWindows 7, 8, 8.1, 10 (32bit/64bit) + .NET Framework 4.0 or later. 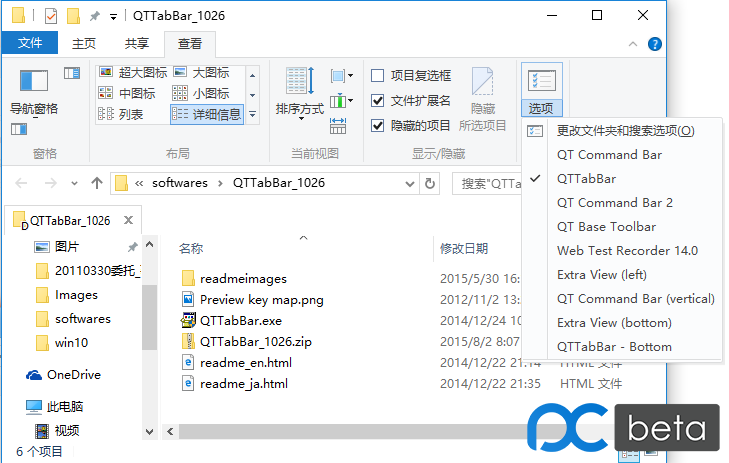 Install Run the installer – QTTabBar.exe. In Windows10TP, you can activate them from ‘Options’ button of Ribbon. 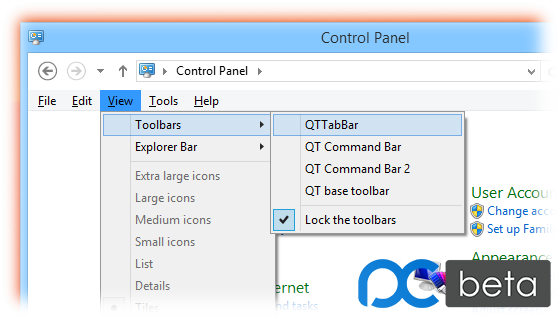 In Windows8/8.1, you can activate the QTTabBar toolbars from Control Panel menu bar.